Chile’s Lake and Volcano District is located in Southern Chile, and covers the area from Temuco city to Puerto Varas. In Amity, we consider this area as a paradise on earth for every hiking lover. Mostly filled with incredible national parks offering stunning hiking trails that will make you fall in love if you are a true nature lover. This is why we made you a list of the best national parks that you should definitely visit if you plan to spend some time in this beautiful part of Chile. Founded in 1941, the Nahuelbuta national park is located on the highest zone of the Nahuelbuta Cordillera, in the Araucanía Region. One of the last strongholds where lives the Araucaría Araucana, it has beautiful hiking trails and natural lookout points. Moreover, it is the perfect place for some local fauna and flora observation. The park covers an area of 6832 hectares, characterized by big forests of araucaria trees, most of them are thousands-year-old. Actually, it was founded in order to protect the Araucaria tree that is native of the Andes mountain range. You can hike 2 main walking trails in the Nahuelbuta national park. The first one is Piedra El Águila located 1.460 meters above sea level. There, you can find a lookout point with a spectacular view over the Andes mountain range, the valley, the Pacific coast and ocean. 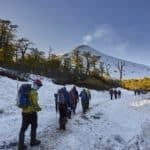 Second, the Cerro Anay (1.450 m.s.n.m) offers a 5-kilometer hiking trail with stunning panoramic views over Los Nevados de Chillán, and the Villarrica volcano. The Conguillío national park is located 148 kilometers north-east of the city of Temuco. It covers a total area of 60.832 hectares. In Mapundungun, it’s “ko-nquillio” which means “pine nuts in the water”. The name is based upon the abundance of the araucaria trees and the surrounding lakes shaping the landscape of the park. With an average of 100.000 visitors per year, the Conguillio national park receives an average of 100.000 visitors a year, making it one of the most visited parks of Chile. Recently, it was designated by the BBC as one of the last places on earth protecting the landscape where once lived the dinosaurs. The famous hiking trail is the Sierra Nevada with amazing views over the Conguillío Lake, Blanco River and the Llaima volcano. With an area covering approximately 60.883 hectares, the park is also part of the Araucaria Biosphere Reserve. Located in The Andes mountain range, the Villarrica national park is a protected wildlife area. The impressive volcanoes, stunning endemic tree forests, rivers and lake are the top components of the landscape. Dominating the scene, the Villarrica Volcano (2.847 m.) is the main touristic attraction. In addition, you can also appreciate the Quetrupillan (2.382 m.) and Lanín (3.776 m.) volcanoes. During winter, it is possible to ski the Villarrica volcano. The ascent to the top is also available all year long, depending on the weather conditions. In the foothills, there are various hiking trails leading to amazing lookout points. The park boasts a total of 63.000 hectares of endemic tree forests such as araucaria, raulí, lenga, etc. The forested areas allow the existence of a diverse fauna like puma, chilla fox, pudu deer, and the small native marsupial monito del monte, among others. The huerquehue national park is located in the foothills of the Andes mountain range, in the Araucanía Region of Chile. It has a an area of 12.500 hectares composed of hills and moutains surrounding small lakes and lagoons of cristaline water. In Mapundungun, the Mapuche’s native language, it means “place of messengers”. This park was created in 1967 with terrains unoccupied by the colons. There are 2 main hiking trails available in the Huerquehue. First, los Lagos Trail, is an easy 12-kilometer long in which you can visit waterfalls, lagoons along with stunning views over the Caburgua Lake and the Villarrica volcano. The second, is the San Sebastian Trail, of an intermediate level of difficulty. The hiking trail is approximately 13-kilometer long. The final reward of the hike is the panoramic views over the surrounding volcanoes (Lanín, Villarrica, Quetrupillan, Llaima) and the Tinquilco and Caburgua Lakes. If you consider visiting this amazing district during your trip in Chile, we highly suggest you to come in spring/summer. The main reason is the weather. During winter (June to September), it rains and snows in the region, covering all of the hiking trails with snow, making the use of raquets mandatory. In Spring and summer (october to March), it is the ideal time as the weather offers the perfect hiking conditions, and the trails are all cleared. In fall (April to May), it is a true spectacle of colors. The leaves of the endemic trees lose their green color and slowly switches to yellow and red colors.